It’s been a quiet summer here at Chaos Manor South. TOO quiet. It’s been hot. It’s been cloudy. With the economy in the toilet, I haven’t had those welcome invitations to speak at distant star parties up where it’s cool and clear (wherever that is). I did get down to Chiefland for a couple of days, but that was just a couple of days. Yeah, it’s been slow going on the astronomy front. Mostly what I’ve done—been able to do—is cruise Astromart and Cloudynights and keep after my Yahoogroups. I was doing that one recent stormy afternoon when out comes the weird “bloop” that means Outlook has received a new message. A quick scan of the missive revealed it was from a nice feller named “Don,” a brother ham (amateur radio operator…Rod’s days as a ham actor is another story) over in our little bedroom/retirement community of Fairhope, Alabama. Seems as how he had heard of your Old Uncle’s efforts regarding public outreach—we set up up at Fairhope’s Fancy-dan Eastern Shore Shopping Center a couple of times a year—and my work with my students. He went on to say he had an old telescope he’d like to donate to the cause. Further email exchanges and a telephone conversation revealed this was, he thought, a 6-inch Newtonian, probably a Criterion RV-6 Dynascope. An RV-6! Now that brought back memories. Memories of a young man in search of a good telescope. As I’ve noted in other blog entries concerning amateur astronomy back in the hallowed Day—the 1960s in my case—I was mostly beguiled by Edmund Scientific’s Super Space Conqueror 6-inch Newtonian. That probably had a lot to do with Edmund’s hefty digest-sized catalog and its especially hefty astronomy section, which I basically read to pieces over the summer of ’65. That didn’t mean I was unaware of the doings of Edmund’s main competitor, the Criterion Manufacturing Company of Hartford, Connecticut, howsomeever. Actually, there was no way I could not be aware of Criterion and its Dynascopes. The summer of my first year in the amateur ranks, Criterion was in its heyday, and every issue of Sky and Telescope bore huge full-page ads for their gleaming white-tube Newtonians. The company had got its start a decade previous with a sub-3-inch reflector (a common item then; remember the A.C. Gilbert?). They found a market and soon progressed to the 4-inch Dynascope, and from there to glory, which included nice (and expensive) GEM Newts in apertures from 6 to 16-inches. Or so they said…I’ve seen and used 12-inch Dynascopes, but never run across a 16 or even seen a picture of one. These were, mind you, very expensive telescopes for the late 1950s, with the initial 6-inch going for a forbidding $475.00. 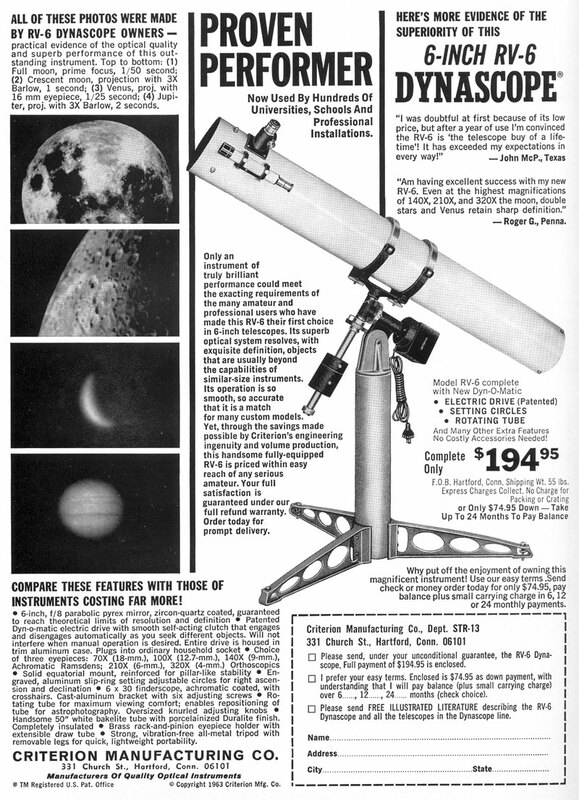 When this telescope was introduced in 1957, the average American wage was about $70.00 a week, and that oughta give you an idea of what this price meant to the prospective telescope purchaser. To put it another way, in terms of buying power the 475 dollars the Criterion cost is the equivalent of about $3700.00 today. And even that don’t hint at the difficulty the average person would have in coming up with such a sum for a “non-essential” like a scope. I don’t know if Criterion ever explained what “RV” stood for, but it was later said that was “Real Value.” And it was clear in the advertisements, at least, the RV-6 would be just that. Yes, it was cheapened significantly compared to the REAL 6-inch Dynascope, and not just price-wise. The mount was a little lighter-looking, the tube end-rings had disappeared, and so had the permanent pier. The RV-6 was supported by a pedestal not unlike what Edmund sold. Also, and not surprisingly, gone was the 50-mm finder, being replaced by a prole 30-mm job. One thing the new kid did have going for her was an electric clock drive, the company’s “Dyn-O-matic” (more on that later), which was included for the base price of $194.95. You also got three eyepieces, and were allowed to choose the three from a fairly wide selection which were mostly Ramsdens on the long focal length end, but Orthoscopics on the short end. In the Sky and Telescope advertisements, the RV-6 doesn’t look as nice as the more expensive model 6, which Criterion would shortly begin calling the “Electric Deluxe," but it is undeniably pretty with a lovely Bakelite tube (a resin/fiberglass-like stuff, younguns) and silvery hammer-finish pedestal. In other words, it was an attractive telescope with some features that, frankly, put it a step or two ahead of its Edmund competitor. Starting with the OTA. The 6-inch Super Space Conqueror had an aluminum tube, and, in my youth, I thought that preferable to Criterion’s Bakelite, which somehow seemed “cheap." In truth, the Criterion has a very important advantage here: weight. Didn’t make much difference in 4-inch scopes, but at 6-inches aluminum was beginning to stress out the typical 60s GEM as well as make it harder to tote the scope into the backyard. Otherwise? The Dynascope finder is hardly generous in aperture, but 30-mm is still better than the 23mm joke Edmund used on its telescope. Optically, twarn’t no difference primary wise, with both companies (mostly) using an outfit called “Upco” as their supplier. This firm, I've been told, was owned by telescope guru Sam Brown. There is no doubt they turned out some fine mirrors whoever was at the helm. Certainly the Dynascope’s three eyepieces were a sight better than Edmund’s el cheapo ½-inch Ramsden and 1-inch Kellner made from uncoated war surplus optics. Edmund did throw in a Barlow, but, take it from somebody who’s used one, it wasn’t much. It’s in the mount, though, that the RV-6 really pulls ahead. Not only does Criterion’s GEM look better than Edmund’s analog—better finished and far less crude looking—it is better beneath the skin-deep, too. For one thing, there’s a “toe-saver” on the counterweight shaft. Might not sound like a big deal, but Li’l Rod lost the toenail off’n his big toe thanks to the lack of this feature on the Palomar Junior. The setting circles on the RV-6 are too small to be of much real value, but they are at least more attractive than the Space Conqueror’s; they are nicely engraved aluminum dials rather than the cheap plastic circles Edmund used. The real winner, though, is the clock drive. Like Edmund, Criterion included an RA drive in the purchase price (rare back then). That’s where the similarity ends, though. The Edmund is a manually engaged/disengaged thing with exposed gears of indifferent quality. The RV-6, on the other hand, used Criterion’s “Dyn-O-Matic” drive. Yeah, I know that sounds like the creation of those 1960s Madison Avenue Madmen, but the drive really was better than Edmund’s or most similar units. The “Dyn-O-Matic” stuff refers to the fact that the drive is equipped with a cork slip clutch. That meant you didn’t have to fool around with manual drive clutches and RA lock knobs. Want to look at something new? Just grab the tube and move it. The drive “automatically” disengages and re-engages. Sweet. The gears themselves are a decent brass worm/wheel set, and are very well made. Quite a few Dyn-O-Matics have continued operating decade after decade with little or no maintenance. That was Problem One, though. Criterion also faced a Problem Two that was at least as serious: they couldn’t depend on selling as many scopes to amateurs as they used to. For a while, Criterion had the bread and butter amateur market locked up. Sure, there was Cave, Unitron, etc., etc., but while those scopes are much talked about today, back then almost nobody could afford ‘em. The RV-6 brought home the bacon year after year. In 1970, though, the picture changed suddenly and dramatically. There was this smallish telescope company in Southern California, you see, “Celestron Pacific.” They’d been around for the better part of a decade, but were hardly much competition for them little ol’ scope-makers in Connecticut. 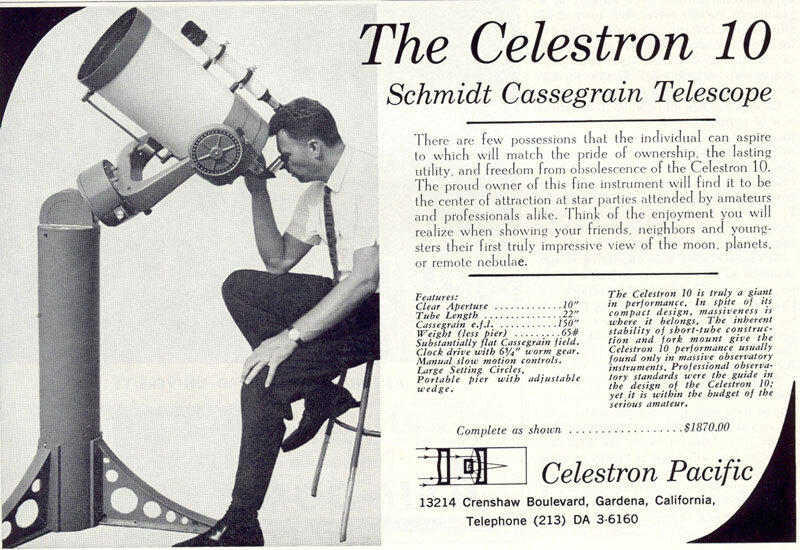 Celestron had previously focused on fancy and expensive Schmidt Cassegrain telescopes for colleges and wealthy amateurs (Johnny Carson was one). Yep, the RV-6 may have sold like a VW, but Celestron’s C10 (you can, by the way, find many more classic scope ads and much other fascinating stuff on Phil Harrington's excellent website) had the distinction of costing as much as a Volkswagen Beetle. If things had remained there, Celestron would have been a minor thorn in Criterion’s side, nuttin’ more. They didn’t. Celestron’s founder, Tom Johnson, finally decided he was ready to sell to the average Joe and Jane Amateur Astronomer, and, in 1970, brought forth the Celestron Orange Tube C8, which was Criterion’s death knell. Not that the RV-6 couldn’t compete with the new scope on price. The RV-6’s cost began to rise as the 70s got underway, but even at its max it was still little more than a third what a C8 cost. Once you paid for (ahem) options for the Orange Tube like a tripod (! ), you was looking at 1000 dollars. Funny thing, though? The C8 sold like hotcakes. Part of it was that the average Americano was now a little more affluent, but a larger part was that the C8 just made sense, and amateurs were willing to save or borrow for one if necessary. The beautiful white-tube GEM Newts represented the old amateur astronomy. A time when most folks could observe profitably from their backyards. As Saturday Night Fever replaced Woodstock in our hearts, many amateurs found they had to travel to escape growing light pollution. While GEM Newts could do very well indeed from dark sites, the problem was getting ‘em there. Ever try to cram a Cave 8-inch f/7 into a Chevy Vega? “What” was changing, too, not just where. We began to focus more on the larger deep sky rather than just bright planets and Messiers. And some of us even dared to try to photograph what we saw. The C8 turned out to be perfectly suited to these tasks. Our beloved RV-6es and Space Conquerors and Caves and Optical Craftsmen and Starliners? Not So Much. Criterion’s owners, John Krewalk and his son, weren’t stupid. Being sharp bidnessmen, they realized exactly what was happening, and it didn’t take them long to decide that if they were to continue the Criterion success story, they’d have to compete directly with Celestron. In 1972, they began to do that, or tried to, anyway, with their Criterion Dynamax SCT, which was a pretty thing with a nice finish and quite a few accessories. At first it sold well. It was priced slightly lower than the C8, and many amateurs liked and trusted Criterion based on their experiences with the company’s Newtonians. Unfortunately, sales began to taper-off dramatically once the word got out that the Dynamax was a bow-wow. What was wrong with it? The mount was not quite as sturdy as that of the C8. The drive not as accurate. The Bakelite/phenolic tube not as attractive. Mostly, though, it was that the optics were not as good. As far as I know, the company never developed a non-infringing (patent-wise) process that would allow them to produce consistently good correctors. The corrector is crucial for good SCT performance, and for this reason many, though not all, Dynamaxes performed abysmally. Oh, the company kept on with the scope through the 1970s, but didn’t get much traction. In 1981, the Krewalks had had enough and sold everything to Bushnell/Bausch and Lomb. In addition to the (cosmetically refined) Dynamaxes, B&L continued to sell the RV-6 until about 1983. Then it disappeared—except from the hearts of the amateurs who’d owned ‘em. Now back to Rod’s RV-6 story. Actually I didn’t have an RV-6 story. At the beginning of my amateur astronomy career I couldn’t afford one, and when I could, I was “beyond” a lowly RV-6, being on to Caves and then Celestrons. Oh, I’d had a look through one or two over the years. 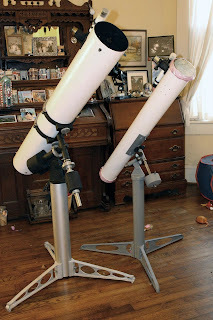 One of my acquaintances in the Atlanta Astronomy Club had bought a vintage Dynascope, and was a purty big booster. How were the images? I have no idea. Frankly, I didn’t pay much attention. But suddenly there was an RV-6 falling into my hands. Shouldn’t I edumacate myself? Numerous web pages and one Yahoogroup later, I had a greater appreciation for the old warhorses. No, they weren’t Caves or Unitrons, but even in this latter age most Dynascope owners rave about the optical goodness of the telescope. After reading testimonial after testimonial from RV-6 owners, I was more than assured that the Criterion had possibilities and was certainly worth my time. I figgered that even if the optics weren’t quite worthy of the praise I’d read, a scope of this sort could still be useful. Many’s the time I’ve wished for something a little simpler than the latest computer-laden CAT to use with the kids. Yeah, I’ve got Dobs, but they ain’t got tracking, and most tend to be easily yanked off target by excited little hands. Seemed to me an old-timey GEM Newt might be just about perfect for the peanut brigade. As soon as I returned from my latest Chiefland expedition, I got a-hold of the Criterion’s owner and arranged for a pickup. The scope was located in the wilds of Fairhope, but, equipped with an address and my hand-dandy Tom-Tom GPS (mucho better than Sue-Sue), I thought I could track the scope down. In due time I arrived at Don’s beautiful home, and was introduced to his lovely wife. Shortly thereafter I was standing in the couple’s garage next to an honest-to-god RV-6. What kind of shape was it in? Good shape. Considering its long life, anyhow. It sure wasn’t a youngun. Based on what I’d read on the Interwebs, the pedestal leg configuration indicated this particular RV-6 was a pre-1970 model. Apparently it had been in the hands of at least a couple of owners over the past 40 (or more) years, and had its share of dings on the tube and rust spots on the pedestal. It was obvious above all, though, that it had been loved, cared for, and, most of all, used heavily. My other impression? How big the RV-6 was. Yeah, I’d seen a few over the years, but I’d forgot how sizeable a 6-inch f/8 Old School scope can be. In my mind, the RV-6 was just a wee bit bigger than the Palomar Junior. In reality, it dwarfs the little guy (see the picture above). Fitting it in the Toyota was a challenge, but luckily doable. The OTA went in the back seat—literally—without an inch to spare. The GEM rode in the trunk without fuss once one of them confounded pedestal legs was removed (via a wingnut). Back home in Chaos Manor South’s venerable living room, it was time to decide what needed to be done to the scope, if anything. Naturally, I consulted with Good Buddy Pat right away and naturally I also consulted Miss Dorothy. Our decisions? Miss D was of the opinion we should seek to keep the scope in as close to original condition as possible. Pat and I agreed. I’ve seen RV-6es with new focusers, new finders, different color schemes, even new mounts. Some of ‘em look right pretty, but they don’t look much like an RV-6. We were tempted to leave the tube’s paint alone, scars and dings and all, and would probably have done so except for an ugly patch where somebody had filled in several ex-post-facto holes. We settled for a light coat of spray, enough to hide the ugly sins without making the scope look different. The finder scope could definitely use paint too. This finder’s optics were in good shape, however, and the crosshairs were intact. The focuser was the main offender on the OTA. It’s a very simple rack and pinion with a brass drawtube. Unfortunately, something was worn enough that there was considerable binding when focus was racked out. Optics? A glance down the tube showed the primary was in excellent shape. I’m tempted to think it’s been recoated at some point, or has been really well taken care of. ‘Bout all it needed was a quick wash and a new center dot. The secondary mirror was in OK shape, but the spider was pretty messed up. At some point, someone had evidently disassembled the OTA, maybe to patch the tube, and the spider/secondary support was assembled incorrectly. Someone had also apparently been collimating by bending the spider, as the (brass) vanes were ugly looking. Finally, the primary mount had also been reassembled incorrectly, and was impossible to adjust. The mount also needed a little work; especially the large rust spots the pedestal sported. A little touch-up of the GEM head with some flat black paint was also called for. The pretty setting circles could stand some cleaning, as could the pier legs. That was all for the visible problems on the mount. What we was worried about was the invisible, the drive. I’d been warned by Criterion aficionados that the most common and often the most difficult to fix problem with the old scopes was an inoperative Dyn-O-Matic drive. Taking the bull by the horns, I grabbed up the line cord and plugged it into a wall socket. Nuttin’ honey. Wait…if I pressed my ear up to the drive housing, I could hear some faint ticking. That was a good sign, warn’t it? The verdict would have to wait for disassembly and testing. In due course, Pat packed the scope up and headed back across The Bay with her. Before he left, I made sure to stress that he take his time and not go to any special trouble, in other words, “no hurry, bro.” Pat, however, is one of those ATMs who loves a project, and he couldn’t resist getting into an RV-6 up to his elbows in a quick hurry. Still, I was danged surprised to hear little more than a week later, “Done!” Part of that is testament to the fact that the old telescope really was in pretty good shape. It’s also, of course, a result of Pat knowing what he’s doing. According to him, there hadn’t been any real stumbling blocks, with the only slight difficulties being figuring out how the primary cell went together and doing something for the poor ol’ focuser. His verdict on the latter was, “pretty much worn out.” He was, however, able to get it going again by shimming one side via some filler compound. Other than those things? As we’d expected, a little paint and a little elbow grease. You can bet that once the weekend came I hopped in the car and dashed over to Pat’s. The weather didn’t look overly promising, but down here you never know, and I figured if I could just get a peep at Jupiter that would tell me all I needed to know about the RV-6’s optics. How did the ol’ gal look after Pat’s ministrations? Beautiful. As he says, it will never look new, but it does look like a babied 40 year old telescope—and that’s really the effect we wanted, anyhow. While I was admiring this refugee from the 60s (who whispered to me that her name was “Cindy Lou”), Pat removed the cover on the drive assembly to show me what was what. It all looked very good. The gear set looked sharp, and, most of all, the wiring was clean and still flexible. The motor was all nice and shiny, too. In fact, I think it’s possible the motor (not the gears) was replaced at some time over the years. Anyhoo, we searched in vain for a date stamp on the motor housing, something I’ve been told is common for the motors Criterion used. Moment of truth time. I inserted a 25-mm Plössl and pointed the scope at the single sucker hole. Staring out of that was the bright blue eye of Vega, which was convenient to use as a finder alignment tool. In the course of adjusting the finder, I noted that Vega looked nice and small. Examining its in/out-of-focus diffraction rings with a higher power eyepiece seemed to show the scope to be pretty well corrected. It was hard to quantify the star test in indifferent seeing, but I think it’s pretty clear the mirror in the scope is a decent paraboloid rather than the sphere some RV-6 owners have reported. I also noted, very happily let me tell you, that the drive was doing a good job keeping the star centered at 100x. By the time I was done fiddling around with Alpha Lyrae, it became obvious that, for once, the weather gods had taken pity on your Old Uncle. That sucker hole had expanded to encompass the entire sky, and the summer Milky Way had begun to shine prominently—something rare in Fairhope in these latter days. I can remember staring at Stephen’s Quintet in awe-struck wonder with Pat’s old 24-inch Dob from this site. The trick was not to see all the galaxies, but to see if you could make out their Hubble Types. But that was about a decade and several subdivisions ago. M13: It really wasn’t quite dark enough to allow the Great Glob to strut its stuff, but, still, I was impressed at the resolution, and that the stars looked so tiny. In the course of admiring M13, we switched in the RV-6’s single remaining eyepiece, an 18-mm A.S.P. (“Achromatic Symmetrical Plössl,” I reckon). What was it like? I’ll just say eyepiece technology has come a long, long way in 40 years. Back in went the 13 Nagler. M27 showed off its apple-core shape to beat the band. Even more impressive was the rich field. The stars were tiny, hard pinpoints to the edge of the field. I reckon there is something to be said for this f/8 business. M22. Over Sagittarius way we went. Naturally, given the good state of the skies and our decently low latitude, M22 was a marvel. But certainly the old RV-6 contributed. Again, nice, small stars and more resolution than you’d think a dadburned 6-inch would be capable of. M8: Since I was writing a blog article on this wonder, it had been on my mind in a most favorable fashion. Cindy Lou did not disappoint, showing sharp stars, sufficient nebulosity, and a starkly visible dark lane. The Hourglass nebular “condensation” was readily visible. M20 wouldn’t put your eye out, but all the petals of this cosmic flower were distinguishable, pretty good work for a “small” scope. M17: when I finished hunting around and finally centered the thing (has go-to ruined your Uncle? ), I was impressed. No, it was not as good as in Pat’s nearby fast 8-inch, but it was good, with the Swan neck easy and dark detail visible along the body. M11 looked more like a glob than a galactic cluster. I was well satisfied that our (mostly Pat’s) trouble had been worth it. How could I help but be? Cindy Lou looked satisfied too, as if it had been a long, long time she’d been able to drink-in sweet starlight in the copious quantities we’d offered her on this night. And here’s to 40 more years of starlight for the old gal. Not with Unk at her side, of course—that would be quite a trick given how he’s abused the bod—but with some discriminating young person, maybe even one not yet born. That’s the goal. I’ll certainly enjoy using Cindy Lou with kids and students, but I have no doubt I’ll eventually run across a bright-eyed and bushy-tailed young amateur seeking her first scope, some special youngun able to appreciate that e’en humble telescopes can age into fine wine. I wonder if the trouble Meade and Celestron are having now is due to the fact that the market may be saturated, where everybody who wanted an SCT already has purchased one. Hard to say, Matthew. That has actually been the case for a while, I reckon. Most of the sales are likely to newcomers or to old hands trading up. I have one of these. Anyone want to buy it? how much is it worth these days?